As it happens, a few days after this visit to Venice, the Independent compiled a list of the world's least romantic cities, which in true hipster journalism style includes Venice. I suppose I can see how some people might go to Venice and fail to have a good time, but I think they're almost all going to be people who haven't done any research, are a bit naive, and spent their whole trip wading through crowds and being snared by tourist trap restaurants, etc. That said, on this, my third visit to Venice, I had pretty much just showed up, I'd only done a little bit of research for new places to visit (having focused most of my planning effort for the trip to Italy on Turin, Alba, etc). I'd done the now standard bacaro crawl yesterday, including three new bacari I hadn't been to before - but also recovering a lot of familiar territory. Up until this morning it had been, you know, nice enough, but almost like looking back through my own photos from previous trips rather than the excitement of seeing and experiencing those places for the first time. I didn't mind too much, I knew it was a very short trip to Venice this time - I was here less than 24 hours - so my expectations were realistic. Anyway, I happened to wake up quite early this morning. 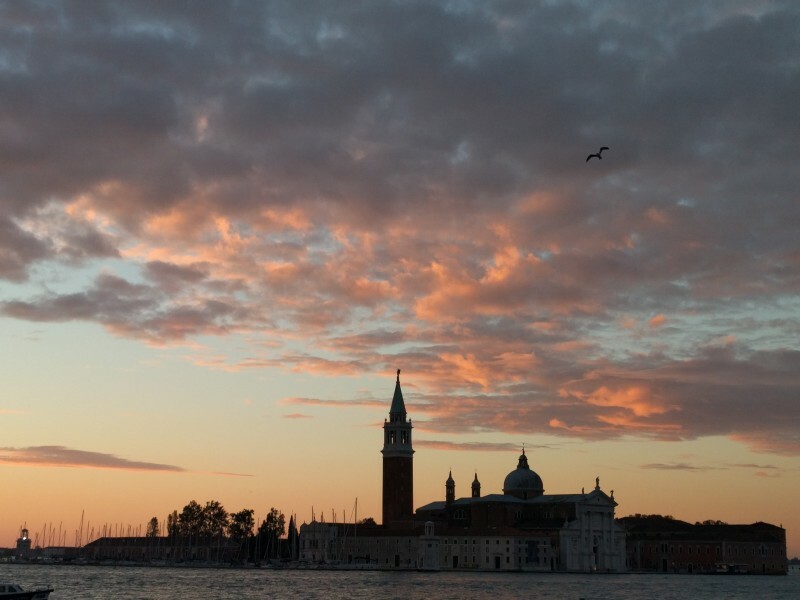 I'd watched the sunset from La Giudecca yesterday, Spritz in hand, which had been lovely for the atmosphere and the overall setting, but it was quite cloudy, so only really a hint of what I know a sunset can be like in Venice. So it occurred to me I was in time this morning to give it a second chance - this time at dawn rather than dusk. Worst case it would be cloudy again, and I'd just have a pleasant early morning stroll through the streets of Venice when there weren't too many people about. Without really giving it too much thought my feet led me towards San Marco - my hotel was by the Rialto bridge, and you can actually get between the two in not much over 5 minutes when there aren't any slow moving tourists to work around. Even the streets on this major tourist thoroughfare had a magical quality at this time of the morning, the tacky souvenirs all hidden away behind the shutters, and barely a soul about, apart from the odd porter making their early morning deliveries. On arrival in San Marco I saw a band of golden light at the horizon between the Basilica and the Campanile, and mostly clear skies - I knew at that point I was in for a treat. To begin with, there was that band of light at the horizon, then further up in the sky dark grey clouds. I saw the sights around San Marco and over to San Giorgio Maggiore through a muted palette, but a majestic one of golds and silvers. I walked up and down the water's edge trying to get the right composition of silhoutted gondolas and lamp posts against that gold and silver backdrop. Probably every one of these frames had been composed a thousand times before, and plenty of them by better photographers and with better cameras... but of course I couldn't stop snapping regardless. I noticed amongst the handful of other people also feverishly taking photos, just as I was doing, there was a middle aged Chinese lady who didn't appear to have any kind of camera with her at all. Strange really that she was the odd one out. I almost envied her for it - it must be lovely to have the peace of mind to just enjoy a scene like this without the fear that you might be missing out on a great photo. After I'd been there about 10 minutes, the colours in the sky appeared to fade slightly and I thought perhaps that was the end of the show. In reality it had just been the warm up act. Suddenly, as though somebody flicked a switch, those brooding grey clouds were flecked with pink, and then came the oranges, and the peach, and the whole fruit salad inbetween. It had been elegant before, a sort of restrained majesty to it - but now it was a loud, unabashed, glorious celebration. I took a lot of photos, some came out better than others - but a few scenes are particularly memorable for me. The view of San Giorgio Maggiore across the water partly in silhouette, against a backdrop of those pink clouds, like a watercolour painting - with the silhouette of a lone seagull in the sky, looking the way a child would draw a bird. 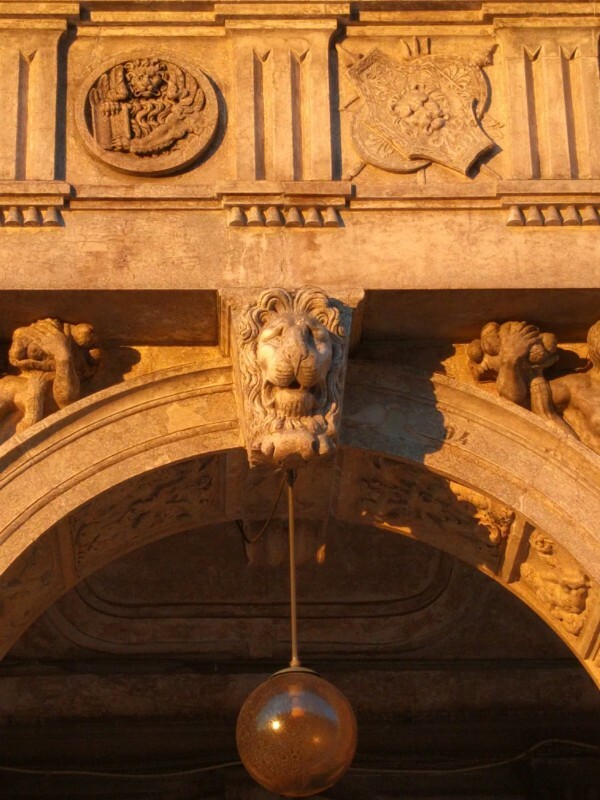 Perhaps most showy of all, the sun shining through one of the arches of the Doge's Palace. Finally - at the risk of being overly melodramatic - although I suspect that horse has already bolted - the lion's head bathed in golden light. It's not really of any great photographic merit, but I wondered how many sunrises like this he had seen. Of course, you can see wonderful sunrises anywhere in the world... but somehow here in Venice, with the way it illuminated the city's magnificent architecture with such gorgeous colours it's as though this is Venice's sun. Doing all of this purely for the sake of Venice. 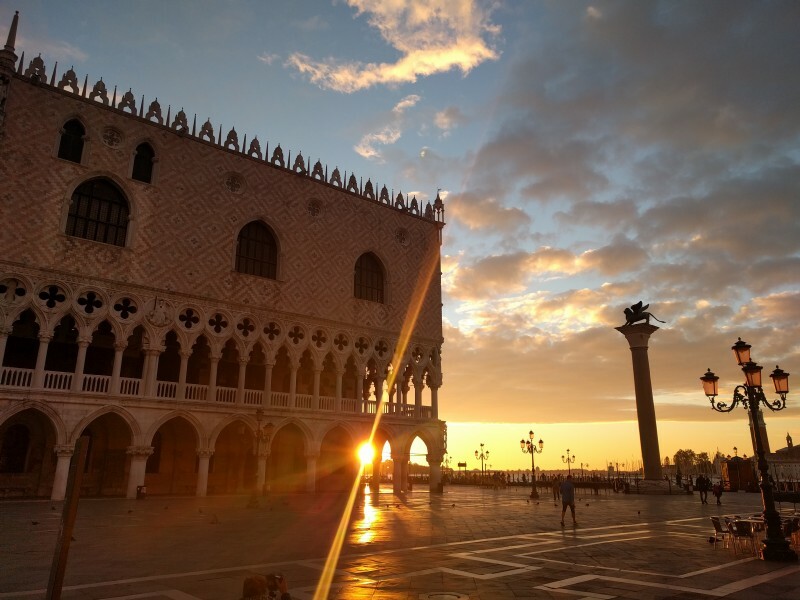 Like witnessing a magnificent stage production, and Venice is commanding the sun to come out of the sea, so the audience can marvel at the spectacle. 1) Just when I was starting to think maybe I've "done" Venice now, it pulled out something utterly magical like this. 2) The Independent can bugger off. It was a magical send off, and it almost felt like the city was giving me a parting gift. 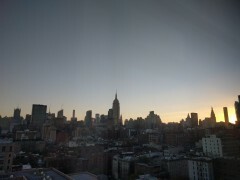 I was beaming on my way back to my hotel for breakfast, then sad that I had to check out and head back to the station. Still, the journey back to Turin was a pleasant one. Again I had a change at Bologna Central, and from there back to Turin I was back on the excellent Frecciarossa 1000, in the extreme luxury of Executive class. I had lunch on the train, delivered to my seat - mozzarella to start, followed by penne with Gorgonzola - both wisely sticking to the principle of using very high quality ingredients but keeping the actual cooking simple. It is on a train after all. On arrival in Turin I met Dad and Janie at the apartment, and we spent the remainder of the afternoon shopping for things to take back to the UK. First I wanted to go to the toy shop down the road to get something for Erika, then we headed to the big Eataly in Lingotto where I mostly bought lots of pasta. We were back at the flat just after 6, and for an aperitivo we had the torbolino I'd brought back with me from Venice, served the classic way, with roasted chestnuts (fortunately I'd found someone selling them on a street corner near us). We sat out on the balcony, and there was a tiny hint of a sunset to look at. For dinner we went to a restaurant near the flat specialising in food from the Piedmont/Liguria, where I had two courses of wild mushrooms, including more deep fried wild mushrooms in batter. I think I preferred the version at Vico Palla in Genoa where they were all porcini - it's actually kind of scary to not be able to recognise what you're eating when you're having wild mushrooms! Finally Enrico, the owner of the flat we'd been staying in, invited us to go for a drink after dinner (I think we probably could have done with an earlier night given our very early start the next morning, but it seemed rude not to accept the kind offer!). So we had one last drink at our "local" - Caffe Mulassano, and Enrico showed us the button which makes a spinny thing go round on the wall, apparently used when you can't agree who is going to pay the bill. Unlike earlier in the week, they had their own vermouth back in stock, and although it required quite a bit of persuasion, I got them to do us a half and half of their vermouth and their aperitivo - something like the original cocktail called the Milano e Torino (Campari and vermouth) from which the Negroni is descended. The barman seemed stoically unconvinced by the idea. I wonder if Count Negroni encountered the same thing when he first asked for gin instead of soda. Turin isn't particularly close to Venice, it takes about four hours by high speed train. On my trip to Italy last year I had gadded about all over the place, but as Dad came along this year it was a different type of holiday, and he much preferred to be based in one place. I had ummed and arred a bit about whether I really wanted to go all the way to Venice on this trip - but in the end I didn't seem to be able to resist. Dad and Janie stayed behind in Turin as they thought it would be a bit too much travelling. So this morning I had a relatively early start and got a Frecciarossa 1000 leaving Turin just after 8am. Of course I chose Executive class again, although given the timing of the outbound trip I didn't really get to enjoy much of the onboard hospitality - a bit too early for lunch, and Italian breakfasts are not much to write home about. I had a change of trains at Bologna Central, which looked very different from last time I had changed trains there back in 2012. That time we'd only just made our connection with barely a minute to spare. This time it seemed to take forever to get from the platform I arrived at, to the platform the onward train to Venice went from. Anyway, not long after midday the train was crossing the lagoon to Venice, over that long rail bridge, which feels a bit more like being on a ferry given the views of the water. On arrival I immediately launched into a bacaro crawl - as I was only going to be staying one night I didn't have much with me, so it was no great inconvenience to carry my luggage around, and probably too early to check into my hotel anyway. My first port of call was a new bacaro for me - Bacareto da Lele. Presumably "bacareto" is a diminuitive of "bacaro", and this place was really tiny - inside there was only space for a handful of people to stand, and almost all the customers were outside. Most appeared to be locals, as far as I could tell - at the very least they were talking Italian (or maybe even Venetian) and they certainly didn't look like tourists. They mostly focus on little sandwiches for their cicchetti offering, and the ombra (glasses of wine) are also in miniature, which is the way I like it. Even by bacaro standards this had the impression of somewhere nobody lingered at for more than a few minutes, but I actually rather liked that about it. Next, another new one for me - Osteria da Codroma - apparently a favourite of Nigella Lawson. This looked more like a restaurant on the inside, and unlike da Lele, which had a healthy throng of people outside, it was fairly quiet here - just a couple of guys at the counter, and one table of people sitting down. The wine glasses were quite large here, which again felt less bacaro like to me, but I suppose standing outside, with a barrel to rest my glass on, by the canal with a little Venetian bridge made for a nice enough setting. Next I dithered a little, thinking it might be nice to have lunch, and attempted to get across to La Giudecca so I could visit Snack Bar La Palanca, but I couldn't get any of the machines for the vaporetto to sell me a ticket. Instead I just headed back "inland" and went to Cantinone Gia Schiavi next. I ordered from the slightly intimidating landlady there and she rather curtly corrected my naive attempts to formulate Italian sentences as I went along. I did manage to have three rather nice ciccheti there though despite this, and also a Spritz con Select which made me really feel like I was properly in Venice. I only discovered this bacaro on my previous trip, but I would definitely put it in my top 3 - it's a lovely spot opposite the San Trovaso boatyard, and often accompanied with the ringing of the bells of the campanile of San Trovaso church. A bit more wandering ensued, and I came to my fourth bacaro of the afternoon - another of my top 3 - All'Arco. It had actually been closed on my previous visit to Venice, but I had liked it so much on the first trip I went there twice. I think I managed the pinnacle of my Italian for this whole trip while I was in here, and succeeding in negotiating the entire transaction without any English. Although I think the nice chap who runs the place was sort of humouring me a bit. I had a particularly delicious ciccheti here - some kind of cream cheese, flavoured with truffle, with a piece of porcini on top. A delicious morsel. After leaving All'Arco I walked 5 metres round the corner into Cantina do Mori. All'Arco almost always seems to have a buzzy crowd around it, but do Mori, despite being the more historic of the two - and probably the oldest bacaro in Venice - has often been empty when I've been. Perhaps it's something about the lighting in there which puts people off - it is a bit dingy - or maybe it's the rather melancholy persona of the chap I assume to be the owner. All'Arco seems to just accept the inevitability of the tourists and tries to make the best of it - the staff always seem quite cheery and welcoming. At Cantina do Mori the owner really seems to wish things were different. I did my best to try and get him to perk up a bit, asked him (in my best attempt at Italian) what his favourite of the wines on offer was - I even offered to buy him one, which he politely refused. That did just about get a smile out of him though. I personally don't mind the dim lighting at Cantina do Mori, and the fact it is more of a place for quiet reflection than many of the other bacari. Even the rather glum owner adds some sort of poignancy to it. This is probably the place where you get most of the sense of the ghosts of Venetians of centuries past. I thought it probably time to go and check in at my hotel at this point, so hopped across the Rialto bridge, and was warmly greeted by the staff who all seemed to remember me from last year. After a bit of a rest at my hotel, I headed out again, feeling somewhat peckish. I think you probably can just about eat a full meal's worth of cicchetti whilst on a giro di ombra (the Venetian phrase for a bacaro crawl) but it's a bit harder if you're only choosing the vegetarian ones. So I decided to revisit Arte della Pizza, the excellent little backstreet pizza place, where they seemed a bit reluctant to make a whole pizza to order at this funny time of day, but relented in the end. Obviously I know full well pizza has nothing whatsoever to do with traditional Venetian cuisine, and generally any mention of pizza on the outside of a restaurant in Venice is pretty much a sure fire sign it's going to be a tourist trap, but Arte della Pizza actually does seem to mainly serve the locals - it's not a restaurant, more of a takeaway place with just a couple of stools and a shelf. While I was there I saw quite a few regulars come and go, who the staff seem to know by their first names, which is obviously a good sign. The pizza is really rather good too. I was a bit unsure what to do with myself after that. First I went to the wine shop I remember having seen a sign outside last time advertising the sale of torbolino - the new season's wine, still not quite finished fermenting. I was hoping to just have a glass on the spot, but it turned out they only did off sales. So I bought a litre of the stuff, which they put in an old plastic mineral water bottle for me, and was charged the trifling sum of 2 Euros and 50 cents. And people say Venice is an expensive place to visit? Then I finally managed to get onto a vaporetto - an old lady having advised me I should just buy the ticket onboard, as most of the ticket machines still seemed to be playing up. I think I did a bit of back and forth, having managed to get on a vaporetto in the wrong direction initially, but eventually I was heading down the Grand Canal and across to La Giudecca. I got to good old Bar La Palanca around 5:30, just in time to see the sunset, such as it was today, given the slightly overcast skies. I had a Spritz con Select and stood by the water's edge, looking back to the main island, and I think, on balance, this was probably my favourite part of the day. From there I got the vaporetto back to San Marco, and wandered back to the Rialto area through the windy streets as it was getting dark. Possibly popped back to my hotel for a bit first - I can't remember now - and then headed out to fit in one more bacaro - another new one for me this time - Osteria Alla Ciurma. I think I have come to the conclusion the bacari are very much daytime places, some of the more traditional ones would already have been closed by the time I got here, just before 8 o' clock. You do see people who I assume to be Venetians out and about in the daytime, but once night falls they all seem to disappear, and places like this seem to be exclusively colonised by tourists. So it's hard to form an opinion about Alla Ciurma, probably deserves a revisit in daylight. I had sort of run out of things to do again by this point, after an unsuccessful meander about I got back on a vaporetto again, heading back to San Marco once again. I vaguely thought I might go into Harry's Bar, knowing full well it does tend to just be full of American tourists, but the group of young ladies who were also on the same vaporetto, and gave the impression of being on something like a hen party (albeit a comparatively civilised one) rather put me off. Instead, I found myself drawn back to the back bar at Caffe Florian, wherein I had a nice chat with one of the head bartenders there (I think I had met the other last time), although I suspect I may have inadvertently caused some slight offence when tasting my second cocktail - a Tintoretto - and remarking how light it was - compared to a Negroni. Venice takes on a funny sort of atmosphere at night time - I'm sure it can be mysterious and alluring, but by the time I'd left Florian the dark streets and increasing scarcity of people felt actually ever so slightly menacing. I had a distinct desire to be indoors somewhere bright, warm and cosy. So I decided to just call it a night, and head back to my hotel. In some sense today's visit to Genova was the motivation for this whole trip to Italy. Some time earlier this year I had begun daydreaming about the meal Chie and I had at Osteria di Vico Palla back in summer 2014, while Erika had dozed in her buggy tucked under the table. The mandilli di seta had been one of those particularly evocative food memories from a holiday which, in honesty, hadn't been entirely a success. I think I must have mentioned it to Dad at Easter, and the idea of Dad coming along on this trip came from there. It's about a 2 hour train journey from Turin to Genoa, and it did feel a bit like we were going there just for lunch - on arrival we got a taxi from the station directly to the restaurant, and we only really stayed in the city for about 4 hours or so. Still, I was quite happy with that arrangement, and am pleased to report the food at Vico Palla was exactly as I remembered it. In fact even better this time around as they also had deep fried porcini on the menu, which seemed a very decadent use of such a prized mushroom, but here in Italy they can be found in abundance, and this was actually a really nice way to cook them - it really sealed in the flavour. I hope Dad and Janie really enjoyed the meal too - I think they did. After lunch we took a stroll along the harbour - which had a lot more superyachts than I remember - and then into the city for a meander through the windy streets. I had a couple more places on my todo list for the visit - first I wanted to pop into a caffe called Marescotti having seen it last time, and having been intrigued by the title "liquoreria". They did indeed sell a large assortment of liqueurs, aperitivi, etc. Most interestingly I discovered they had a Genovese vermouth, which I of course had to buy a bottle of. Then we went to relive the other wonderful food memory from my previous visit - the blissful gelato at Profumo di Rosa. We chatted to the lovely lady who ran the place, and I told her what happy memories I had of being there with Erika, having her first proper gelato. From there we gradually meandered back in the direction of the station, taking in the very grand Via Garibaldi en route. It took another couple of hours to get back to Turin, I think we got back some time around 8, and then I think we just stayed at the apartment for the remainder of the evening. Didn't really have anything planned for the day. I had considered going to Milan, but when I looked into it most of the places I most wanted to visit (the Camparino, Nottingham Forest etc) closed on Mondays. So I just mooched around in Turin. I suppose to some extent this was just as well, as I needed to do some laundry in the morning, and figuring out the Italian washing machine took some effort. It was a combined washer dryer, of which two functions only one seemed to really work - everything came out absolutely dripping wet. I eventually realised he radiator in my room was on, so managed to hang some things there, and the rest out on the balcony. So after my morning of domestic chores I headed out, around 11:30, thinking I might have a nice bicerin somewhere, then lunch. Al Bicerin seemed the obvious venue for this, but I was rather taken aback to see a queue out the door! On a Monday morning in October! So I headed on instead to take a look at "Caffeteria Vermoutheria Barolino Cocchi", which I'd had on my list and was interested to see what a "vermoutheria" entailed. As the sun was not yet over the yard arm - it wasn't even quite midday - I couldn't quite bring myself to have a vermouth, and just had a coffee, thinking I would come back later on in the day. Bizarrely it's actually open during office hours, Monday to Friday, which struck me as a bit bizarre for somewhere which was surely primarily a bar. For lunch I went to a pizza place I had starred on the map at some point - not really sure why - and I suppose the pizza was decent enough, albeit a bit soggy in the middle. It was incredibly cheap, I think my lunch, including an optional glass of wine (I went for water instead) came to a trifling 7 Euros 50. Wasn't sure what to do with myself after that. I had a look around on my phone for any grand caffes I might not have been to yet, and found I wasn't that far from Caffe Platti, which would be a new one for me, but was one of Turin's most famous. So I headed there. I had a slightly arduous time ordering a vermouth - and stopped just short of saying "You know, the thing you city is bloody well famous for! ", but did eventually manage. Turin is spoiled for these grand, opulent caffes, and here I wanted to describe the interior as some kind of rococo, but I'm probably a bit out of my depth. I didn't linger long, and after that went back to the apartment, where I spent most of the rest of the afternoon. I think I may have actually had a nap for a bit. Around 5, I purposefully headed out again, not quite believing that the opening hours for the "vermoutheria" I'd poked my nose in at earlier could be correct, but indeed it was now closed. What a bizarre place - I wonder who their customer base is - it's certainly not on the tourist trail, if such a thing even exists in Turin. I met up with Dad and Janie briefly at Caffe Fiorio near the apartment for an early evening aperitivo there, but I didn't really feel like eating in, and instead I did a bit more aimless wandering, this time in the direction of Piazza Vittorio Veneto. I vaguely considered trying to have dinner at Porta Di Savona, which I get the impression is one of Turin's most famous restaurants, but the combination of not quite being able to tell whether there was anything vegetarian on the menu, and having a feeling it might be fully booked, put me off. Instead I ate at the vegan restaurant near there - since electing a vegetarian mayor recently Turin seems to be developing a growing culture of vegan/vegetarian restaurants. Somehow though I wasn't really bowled over with the meal. I then popped over the river to a wine shop / bar a colleague had recommended, which had a better than average selection of vermouth, and had a quick drink here plus bought a bottle (of "Belle Epoque") to take back to the UK. Headed back toward the apartment after that, finishing the evening with a final drink at our "local" - Caffe Mulassano. One of the benefits of being based in this corner of Italy for a week at this time of year was being able to go to to the Alba White Truffle Fair. It's staged every weekend in October, and most in November, and people come from all over the world to eat, buy and learn about white truffles. I hadn't been before, and wasn't quite sure what it was all going to be like, particularly as a lot of the website is in Italian. I had the impression if it was just a case of visiting a market of sorts then it might not be quite enough to fill a whole day out, so I had also enrolled us on the "truffle sensory analysis" session in the morning. This turned out to be quite a good beginner's course starting with general information concerning what exactly a truffle is, where they're found, and what their life cycle is; then moving on to an exercise in how to evaluate the quality of a truffle, and pick the good from the bad. Thankfully although the course instructor spoke in Italian, he was accompanied by a translator who gave us the English version in near real time. There were of course twists and turns when it came to our turn to evaluate some truffle samples - and the vast majority of the attendees failed to pick the one the course instructor deemed to be the best specimen. The particularly surprising learnings from this included the fact that a truffle can actually have too intense a smell, and that's not considered a positive thing (?!?). Also one of the truffles had lots of little holes in it, having been partly eaten by some kind of parasite. That was obviously a bit off-putting to look at, but again in the topsy turvy world of truffle evaluation this is apparently a positive thing - since the little critters only eat the best truffles. Forearmed with this new knowledge (or more rather a sense that I really had even less idea what I was doing than I originally thought) we headed into the fray of the stalls selling truffles, and I did my best to choose a prize specimen. In the end, it was more a whim than anything else - some of the stalls were manned by the truffle hunters themselves, selling their own bounty, and I chose one of those. A particular truffle caught my eye, about the right size for a meal for three, and not too crazy a price, and the hunter told me had just unearthed it last night. That's always one of the things I've found a bit off-putting about buying truffles in London - the people in the shops never seem to be able to tell you when it was dug up, and for smaller truffles it'll be past its best within 3 or 4 days. So I was very pleased with my purchase here, and it was especially nice to be able to shake hands with the man who had found it for me. I also bought a nice looking truffle shaver while I was here - a really smart looking one with a wooden handle. That aside though, the market area of the truffle fair was pretty busy and none of us felt so inclined to browse for an extended period. So after a while we headed out into the streets of Alba for a wander round, and had a slightly frustrating time trying to find something for lunch (ended up just going to a focaccia place). We then rounded off our visit to Alba at a lovely little caffe called Pettiti, which, from the mirrored signs I could see used to make its own vermouth - so I was reminded of Caravatti in Mantova. Then after that we go the train back to Turin. We planned to have a late dinner that evening, so I popped out for an aperitivo beforehand, this time trying a bar called Farmacia, where they served Negronis in little medicine bottles, which was a cute idea. Then the grand finale of the day - our truffle extravaganza for dinner. We started with a pasta course, using the local version of tagliolini they call tajarin in the Piedmount, in a simple buttery sauce, with a bit of a Parmesan type cheese I'd bought, and, of course, a generous covering of the shaved white truffle. Then we followed that with a fonduta, per the Elizabeth David recipe - the Italian version of fondue - also with more shavings of white truffle on top. I'd decided it best to not plan to do too much today, thinking we might all be a bit tired after the long journey yesterday, and also as we were planning to cook while we were here we should probably take the opportunity to stock up on food supplies. So the morning was spent at the cast sprawling market in Turin, which, it being a Saturday, was really full swing. Amongst other things we bought fresh porcini and some really nice looking fresh parpadelle to have for dinner later. Also at the edge of the market I found an impressive wines, spirits and liqueurs shop which helped to partly answer the ongoing question I've had over these past three visits to Turin: "Where's all the vermouth?". It was a real Aladdin's cave, and I was able to find both a bitter aperitivo and a gin made in the Piedmont, which, along with quite a few interesting options for local vermouths allowed me to buy everything I needed for a Negroni Torinese, or perhaps a Negroni Piemontese. Had a pizza for lunch, at a place which didn't look particularly wonderful on the outside (and hardly anyone else was eating there) but turned out to be decent enough. Although I perhaps slightly regretted ordering the strange "fried pizza" for which I forget the exact name they used on the menu. I thought this might be something like a fried calzone, but instead it was an oddly deconstructed affair, with sticks of fried bread, accompanied by raw tomatoes and mozzarella - more like a salad than a pizza really. In the afternoon we decided to get the rack railway up to see the Basilica di Superga. The weather didn't really bode all that well for our time in Turin, and Dad thought today might be about as clear as it was likely to get. It was still too hazy to really appreciate much of the view from the top, but I suppose it made for a pleasant enough afternoon outing regardless. On the way back to the apartment we stopped off at Pasticceria Abrate (confusingly pasticceria means a place selling sweet pastries in Italy, but often these places are more like bars) for an early evening aperitivo, and I managed to talk the bar staff into giving us a sort of vermouth sampling board. I didn't quite recall exactly which was which, but I think Del Professore was one of the stand out winners. For dinner I cooked, and we had a tomato salad with burrata (Dad apparently had that before) to start, followed by the parpadelle with porcini, which came out rather well even though I do say so myself. After dinner I was in the mood to see a bit more of Turin's night life - especially given that our remaining nights in Turin would all be Sunday / weeknights. I started off by heading back to an old favourite, Caffe San Carlo. I ordered a Negroni, and asked if there were any variations the bar man could perhaps do for a break from the norm, but he only had fairly run of the mill ingredients to work with, and suggested I ought to go to a more specialised cocktail bar for that. So I consulted Google Maps, and found "Mago di Oz" which was a lot more modern / youthful but did have a few more interesting bitters / vermouths to experiment with Negroni variants. Actually getting the drink I wanted proved to be a challenge though, the slightly unhinged barman there took me under his wing, and kept insisting I try "just one more" of his own personal concoctions - each of which he also had one of himself - and then, honestly, after that one he'd make me the drink I actually asked for. I'm not sure I ever got the drink I originally asked him for. When I finally called it a night and asked for the bill, he asked me how many drinks I'd had, I shrugged my shoulders and said I didn't really know. He said he didn't really know either. I had originally planned the week in Italy with Dad to be while Chie and Erika were in Japan, but as it turned out we actually set off in the morning today, and Chie and Erika wouldn't be flying out until the evening. So I felt a bit bad about that, but Erika seemed to be excited about going to Japan - despite feeling slightly under the weather - so it wasn't too traumatic when we said our goodbyes. I'd booked us into Standard Premier on the way out, knowing that we had a relatively early start, and would probably be nice to have breakfast on the train. On arrival in Paris, following the advice of the chap who had been sharing our table with us, I ordered an Uber to get us from Gare du Nord to Gare de Lyon. I've only ever used Uber in America before - I don't use them as a matter of policy in London as I'm in the apparent minority among my peers of actually really liking black cabs, and feel as a Londoner that's where my loyalties should lie. The last time we used a taxi in Paris though, the cheeky blighter took us right round La Perepherique, and they also charge you a Euro for each suitcase, which I think is a bit of a cheek. So I feel no such loyalty to Parisian taxi drivers. The Uber across Paris was embarrassingly cheap - something like 11 Euros, and it was also very handy as I didn't have to use cash. I had decided en route that we should have lunch at a grand looking brasserie near Gare e Lyon called "L'Europeen" - partly because Dad had mumbled something about how there wouldn't really be an opportunities to have seafood in the Piedmont, so I thought he might like this place as that was one of the things they specialise in. He ended up ordering sauerkraut and sausages. My "assiette vegeterienne" was of course a complete joke, but I was entirely expecting this, it being France, and happy that I had a week of excellent Italian food ahead of me, where effortlessly delicious seems to be no problem whatsoever, unlike their French cousins. I did at least enjoy the bottle of Pol Roger we had with lunch, and I suppose the setting had a sort of glamour to it. Most of the rest of the day was then occupied with the TGV journey from Turin to Paris, which should have taken 5 hours and 37 minutes, but thanks to being stuck behind a slow train for some of the route ended up taking closer to 7 hours. So that did sort of drag a bit towards the end, especially after the Veuve Clicquot ran out and it got dark, but we got there eventually. We took a taxi from Porta Susa to our apartment for the week, which was next to the Piazza Castello, and in the same building as one of my favourite caffes from my previous trip - Caffe Mulassano. So of course after meeting our hosts (who conveniently lived next door, so didn't seem to mind our late arrival too much), we headed straight Mulassano for a triumphant "we're in Italy!" drink. My last day at work before the trip to Italy, and in fact my last day working from the Victoria office. While I was away, our things were going to be moved to the new Kings Cross office, so at the end of the day today I had to pack up my desk and put everything in moving crates. I'd been working in Victoria for just shy of a decade, and whilst it's hard to feel too much sentimentality for the office building itself (especially as my time there had been split between two different office buildings), I had grown rather fond of the area, and quite a few of my favourite pubs and restaurants are in the vicinity. Obviously there's nothing to stop me from going back to visit all those places, but I suspect that will probably be a fairly rare event from now on. Anyway, I didn't have time to dwell on this too much, as I had to get back home to meet Dad and Janie, had arrived from Devon, and were going to stay with us for a night ahead of the trip to Italy. I couldn't quite be bothered with cooking the night before going away, so I ordered in an Indian takeaway from Tiffin Tin, which Dad seemed to quite enjoy, and slightly incongruously served it with a bottle of Nyetimber. A bittersweet sort of a day all round really - although I was obviously looking forward to the trip to Italy, Chie and Erika would be flying off to Japan the next day, and I always seem to get quite melancholy when on the brink of having to spend time apart like that. Particularly as Erika seemed to have picked up a bit of a cold, and was a bit feverish at bedtime. Decided to work from home today - in the run up to moving offices I'd found the prospect of commuting all the way down to Victoria particularly tedious. Plus cutting out the commute in the evening meant I could spend a bit more time with Erika - and we only had this evening and tomorrow evening before they went off to Japan, and I went off to Italy. In fact looking at my location history it sounds like I didn't leave the flat all day. Turned out to be my penultimate day working from the Victoria office as I worked from home the following day. Don't really remember much about today apart from that. I think we had some kind of nabe for dinner, according to chat history, and in the evening Erika tried on some hairbands which Grandma Mary had made for her. It had rather crept up on us this year, both of us being preoccupied with various travel arrangements, plus the usual other distractions of day to day life - work, Erika's school, and so on. Somehow Chie had mentioned that it was going to be our wedding anniversary to Erika's friend's Mum the other day, and she had very kindly offered to have Erika round for dinner this evening, so we could go out for a little bit to celebrate. Obviously we didn't want to impose too much, so just made it a quick early evening outing. I had worked at the King's Cross office in the daytime so it made sense timewise to go somewhere around there - we decided on the bar at the Gilbert Scott. I had the Rhubarb Gimlet which I had really enjoyed when I came here with people from work, and Chie also really enjoyed the Beekeeper (or was it Beehive? I forget). So that worked out rather well - short but sweet. Went to Erika's friend's house after that to pick Erika up who seemed to have had quite a nice time, and to our surprise and delight her friend's Mum complimented us on what nice table manners she had - I don't know how that happened! Ate the first of the apples from our apple tree this morning. 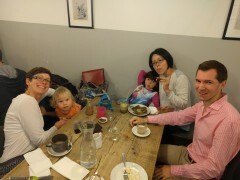 Went to Wahaca for lunch, after which Erika went to play with her friend Zia. Went for dimsum for lunch in South Kensington with a couple of Chie's "Mamatomo" and their kids. Afterwards I left them to it for the remainder of the afternoon, and went for a wander round Belgravia as a sort of goodbye, as I'd be moving offices this month. Worked from the new Kings Cross office today, and tested out walking home at the end of the day. Fish and chips from "KenFish Town" for dinner. Went to watch the premiere of the new Werner Herzog film, Lo and Behold, then afterwards a short pub crawl around Wapping. A couple of random pictures - Erika having breakfast in bed, and the Chap Magazine arrived. Grandma Mary and Ketih came to London for the day to visit. Erika went to a friend's birthday party in the afternoon. After that the three of us popped to the Pineapple. Flight from New York landed in the morning, headed back to the flat, and then spent some of the daytime catching up on sleep. Picked Erika up from school, then Chie took her to a Japanese lesson, and I had a quick pint at the Pineapple to re-Anglicise. In the evening gave the girls souvenirs from New York. 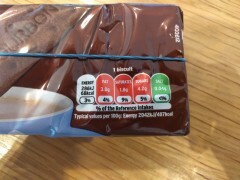 I worked from home today, resulting in this picture of a packet of Bourbon biscuits. Erika, being the social animal that she is, had not just one but two appointments in her calendar today. In the morning, Kyle, Hannah and Ralph were passing through our neigbourhood on the way to a house viewing, so we met up in Bear and Wolf for breakfast and a bit of a play in the playroom, then they came back to our place for a little bit. In the afternoon, Erika had another playdate with a friend from her (now former) nursery. We met up at the Camden Town Brewery "Tank Party" - yes they did actually have some activities for kids! Erika had her face painted and the girls ate something called a "muffnut" - half way between a muffin and a doughnut, apparently. Then we all went back to our place and the grown-ups sampled various Nyetimber bottles while the kids played together.